Chef Set: Includes a ceramic and olivewood trivet, ceramic spoon rest, olive wood cooking spoon, a bottle of Holy Land olive oil, and an apron. Set of five items at a discount price of $70.00, (savings of $18.00). One 500 ml (16.9 oz.) bottle of delicious, extra virgin olive oil is rain-fed and handpicked by Palestinian farmers in the West Bank. The oil is all-natural (no chemical pesticides or fertilizers used). 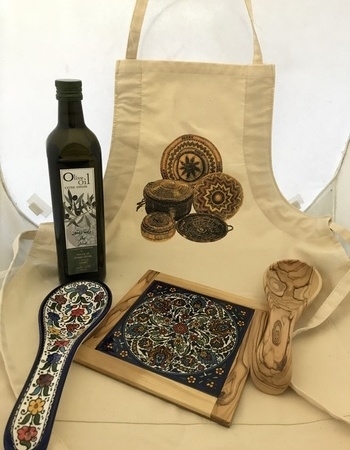 The Mount of Green Olives, an affiliate of Union of Agricultural Work Committees (UAWC), buys this olive oil from disadvantaged Palestinian farmers on Fair Trade principles. Retail price $18.00. Note: Ceramic items are handmade--no two are alike--your selection may not look exactly like the photo. We cannot offer specific design options for gift sets.